Positive construction and engineering (C&E) forecasts give industry members a lot to be excited about: proposed infrastructure spending and moderate growth mean more opportunities ahead for C&E firms. The problem? Many businesses are reporting significant issues hiring enough workers to staff their current projects, let alone fill new ones. Insulation Outlook staff recently spoke with recruiting professionals and Millennial workers to get an idea of how companies can adapt to attract and retain more workers and meet the demands of a growing industry. For Baby Boomers, many of whom now occupy leadership positions in C&E firms, looking for work meant making phone calls and hitting the pavement. For today’s prospective employees, however, nearly all aspects of job searching are happening online—this is doubly true for Millennials. Brittany Hale, Recruiting Team Lead at Mondo, a national staffing agency, confirmed that the vast majority of her candidate searches occur on LinkedIn and Indeed. Job boards such as Careerbuilder and Monster still play a role, but are becoming less prominent as Millennials aren’t as likely to post their resumes on those sites. Ben Vacula, a Regional Sales Manager with K-FLEX USA, a NIA Manufacturer member company, said that when he began his job search, he investigated potential employers on Indeed, LinkedIn, Monster, and even Twitter. Companies looking to recruit would do well to develop their Twitter and other social media presences; Twitter reports that 80% of Millennials access the platform on their mobile phones at least once per day. In some cases, Twitter is fulfilling the role that Craigslist once played as a job-listing site. Robyn Kavanagh, Senior Manager of Human Resources at Performance Contracting, Inc., a NIA Contractor member company, said that they have ramped up their social media and online recruitment activities, including developing a career portal that will allow candidates to apply for jobs on their mobile devices. Mobile optimization is critical for this generation, who expects to access everything on their omnipresent smart phones. With construction projects predicted to increase, the competition for workers is going to get more intense. Companies will have to put extra effort into reaching out to candidates early and often. For Jonathan Colebrook, a Structural Engineer for HOK in Atlanta, much of his early networking was accomplished though extracurricular events and programs, such as job fairs, while he was in college. He explained, “Job fairs were fantastic resources for networking and recruitment. More than a hundred companies would come to [career fairs] in the fall and spring semesters. This was an easy, compact way to view several companies and distribute resumes. I received all 3 of my internships and my full-time position from company relationships started at job fairs.” Kavanagh confirmed they are making a much bigger effort with recruiting fairs, bringing in food at interviewing sessions, taking candidates on jobsite walks, and spending more resources to bring in representatives from branches that are hiring. Even with these extra efforts, making the decision to have an increased presence at job fairs is a fairly low-cost way for companies to find talented, local candidates, and will become increasingly necessary in a competitive job market. Internships can be an effective way to draw potential candidates into your company right after graduation. Companies should work on recruiting at the college and high school level, making sure to reach out to potential employees early. Daphne Hathaway, Director of Human Resources at Irex Corp., a NIA Contractor member company, concurred that reaching students early is vital, and explained that her company is increasing their on-campus presence, noting, “We’re having to compete for people so we’re trying to get in earlier—if you don’t get to quality students before they graduate, they can be hard to get.” They’re also encouraging their branch managers to consider more internships, which helps them connect with students before graduation. Hathaway noted one way her company has engaged Millennials is by establishing Emerging Leaders Groups to focus on helping newer employees learn how to navigate work, establish a work-life balance, and interact with management. This program also helps discern the most effective ways for these workers to learn, and identifies what they may be struggling with; this allows the company to come up with solutions that address their employees’ development needs. They have also created materials explaining potential career paths for newer workers, and then provide the training and coaching to lead them through that path. Proactively meeting Millennials’ desire for career advancement is a critical retention tool. One of the unique aspects of the Millennial generation is that they are switching jobs at a higher rate than seen in prior generations. Hale notes, “Salary is big. They’ll move jobs for that next pay bump to get into that higher salary bracket. Staying in a position for long periods of time isn’t valued the same way it used to be.” Companies that want to retain their Millennial workers should not only prioritize an open culture that embraces fun when possible, but should also make sure they are providing growth opportunities—including the ability to move up and increase salary. Companies that fail to do this may find their Millennial employees leaving for greener pastures. While every office may not have the option to embrace an open floor plan, companies can embrace the culture of an open office by creating opportunities for free discussion and team building between new and senior employees—which can be helpful for both groups. Millennials benefit from the experience of seasoned workers, and veterans may benefit from hearing fresh and new ideas. Many Millennials also report they prefer to work at companies that have a mission they can buy into. For insulation and construction companies, publicizing insulation’s ability to reduce energy usage and environmental emissions can appeal to Millennials’ desire to work for a company that is making a difference in the world. Hathaway noted they often use this tactic to appeal to Millennials’ “sense of social responsibility,” and that it can be a good introduction to construction and insulation for those with less knowledge about those industries. Time in the office tends to be the most frequent source of friction between Millennials and Baby Boomers. Greater use of technology has led to more productivity, and younger workers see the work product as being more important than being at their desk for a 9–5 day, which they often see as a relic of the past. 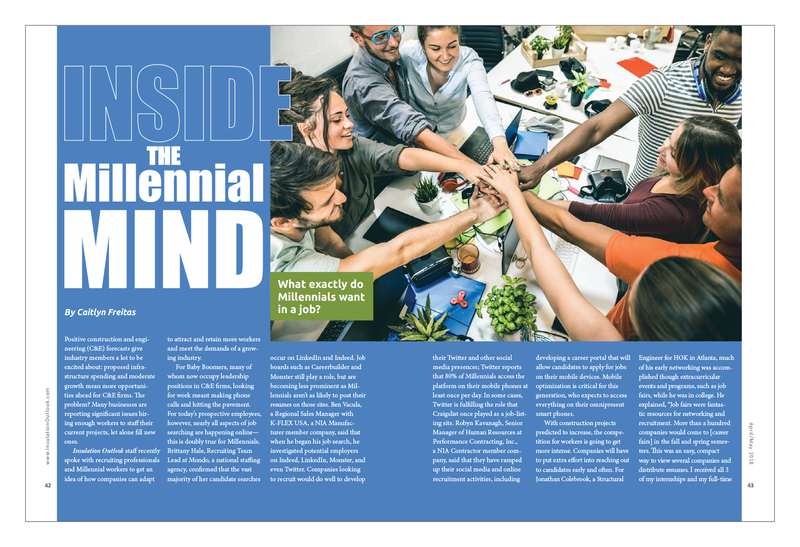 For Boomers, Willis affirmed, “the 9–5 in the office was the bible,” which is why many Baby Boomers struggle with the Millennial desire for greater flexibility. Ultimately, Willis noted, “it goes back to trusting your employees.” He added that if you don’t trust employees to get their work done regardless of their time in the office, then you may need to rethink your hiring practices. Hale concurred that flexible work options are extremely important, and that companies that fail to embrace these options may have a harder time holding on to their Millennial workers. See the “Let’s Get Flexible” sidebar below for some ideas on how to offer more flexibility to your employees. According to the Pew Research Center, Millennials will become the largest segment of the population—overtaking Baby Boomers—in 2019. It will be necessary to adapt to this generation as they will comprise the largest pool of available workers. While adaptation can be difficult, it will be necessary to survive and thrive in a highly competitive environment. Unlimited paid time off or remote work options may not be possible for every employer, but it is important to embrace flexibility where possible. Moreover, make sure you are engaging in a constant dialogue with employees—companies that meet employees where they are and embrace new trends are going to be in an excellent position to attract and retain staff in the long term.